The Season of Advent, which begins on a Sunday about four weeks before Christmas Day, is celebrated by most Christian Churches, as well as some other Christian communities. It is a time for people to prepare themselves for two different things: for the coming of the baby Jesus and Christmas, and for the Second Coming of Jesus, when he shall rule over all the Earth in peace. Not all Christian people remember Advent. Some people use it as a time of fasting, study, meditation and prayer. Special Advent Calendars are made for children, with pictures or treats for each day of Advent. In Germany it is very common to have an advent wreath with 4 candles (mostly red), every advent Sunday one candle more will be lighted so that on Advent 4th all 4 candles are burning and its bright, a symbol for Jesus as the light is coming to us on Christmas. 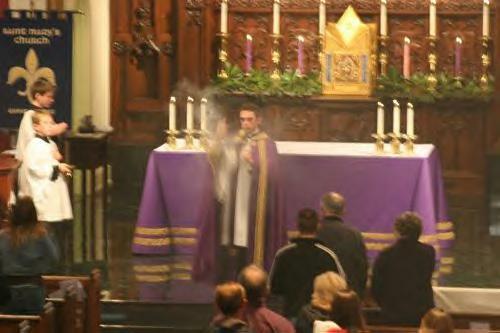 Censing during solemn Advent vespers. Medieval manuscript of Gregorian chant setting of "Rorate Coeli"
Advent Facts for Kids. Kiddle Encyclopedia.